June 6 and 13, 2010 During the two weeks which Pastor Steve was on vacation, Brother Ryan West filled the pulpit of Farmdale Baptist Church for the Sunday morning service. He preached both weeks from Hebrews 10. The first week’s message was titled “Jesus is the Perfect Sacrifice” and was based on Hebrews 10:5:10. The second week’s message was titled “Because Jesus is the Perfect Sacrifice” and was based on Hebrews 10:19-25. You can download the respective messages by right clicking on the titles of the messages and selecting the “Save . . .” option. 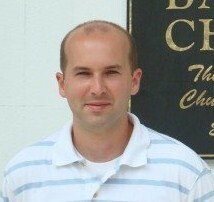 J. Ryan West is currently a PhD student in Historical Theology at The Southern Baptist Theological Seminary in Louisville, KY. He has served as a missionary in Calcutta, India and in an inner-city ministry in Brunswick, GA as well as an associate pastor in two churches in Kentucky. He and his family are members at Sojourn Community Church in Louisville, where they serve in various volunteer capacities.